So here I am in Europe for the third time (after the trips to Britain and France that I did many years ago with my family). I grew-up on Norse mythology, so always wanted to visit Scandinavia, though the part of Scandinavia I’m in right now is a little to the east of where I dreamed of. It’s the land of Ukko, Vainamoinen, and Hiisi instead of Odin, Thor, and Loki, the land of the Finns instead of the land of the Norse. My girlfriend Reetta brought me back to Finland to celebrate the Summer Solstice and meet her family. 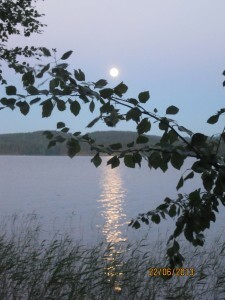 The Solstice is one of the big Finnish holidays (though in Canada has been largely relegated to Neopagans), where Finns visit a cabin near a lake, barbecue lots of sausages, stay-up real late, and take pleasure in being in the “Land of the Midnight Sun.” It took a little getting used to midnight being light enough to read outside and it remained hard to get to sleep, but it was a lot of fun. It was great to meet Reetta’s family, great to wander around by the lake, great to lie down on the pier in the middle of the night and gaze up at the gray sky, the darkest it was going to get. One day it was quite windy and I sat on a rock by the water and gazed at the waves the wind created. There was a “primalness” to the whole thing. I felt strongly connected to nature, to the spot where I was, and to everything around me. It was beautiful. We as a culture so often rush on ahead, focusing on our responsibilities, our jobs, our deadlines, that we don’t pay much attention to our surroundings. Sometimes it’s great to just sit there and “be,” be at rest with the whirling world, be connected to where you are, not what you’re trying to do. BC is no stranger to natural spots like this. I must visit them more often. This entry was posted in Self-Reflection and tagged Finland, Reetta Linjama, Scandinavia, vacation. Bookmark the permalink.